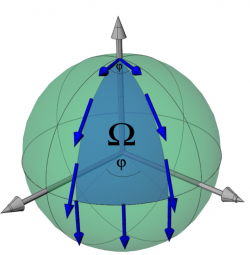 In general a quantum system’s state vector carries phase information, a non-physical property that cannot be measured in an intensity measurement. However, a phase difference between states vectors is a physical quantity, giving rise to the phenomenon of interference. Phase accumulation is, at first sight, a consequence of dynamics of the state evolutions. In addition to and independent of this dynamical phase M. V. Berry discovered in the beginning of the eighties of the last century a phase due to the geometrical origin of the state evolution independent of its dynamical properties. Influence of rotation on the phase of light passing through an optical interferometer has been theortically investigated over a century. The Sagnac effect predicted the observation of a phase shift proportional to the scalar product of the rotation frequency and the area of the interferometer. In 1988 B. Mashhoon predicted a new relativistic quantum mechanical effect, i.e., a coupling of spin with the angular velocity of a rotating reference system. Following the prediction, the spin-rotation interaction has been successfully derived from the Dirac theory, a concrete measurement however is still missing. The first proposal in this regard in- cluded a measurement via neutron-interferometry.